One of the days we are going to a friends BBQ and I thought I would share what I'm bringing as my contribution in case you needed some ideas too! So I'm going to bring this simple summer fruit salad. 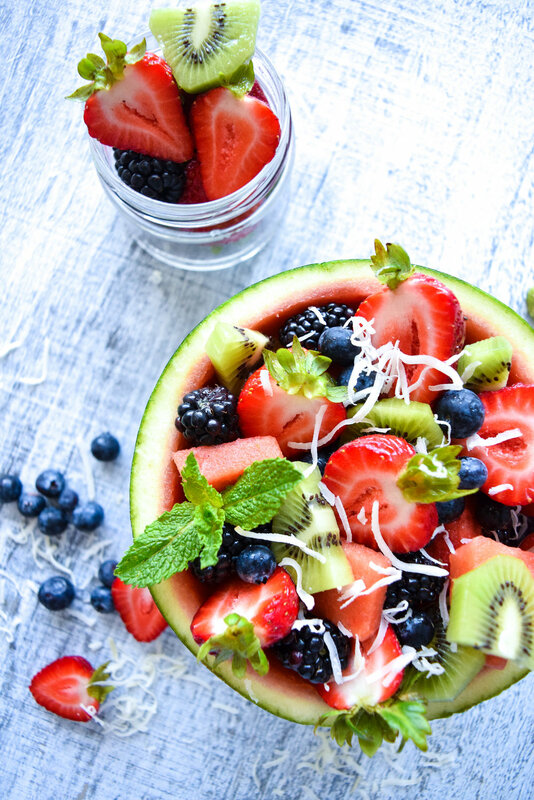 It's easily prepared, so pretty, and who doesn't love fresh fruit on a hot summer day?? Then I top it with coconut flakes (optional) and fresh mint (also optional, but highly recommend). Also - I would bring a couple of limes, wedged, and serve them on the side of the salad. Then people can squeeze their fruit with lime juice if they like. It's not for everyone but I personally love it. ALRIGHT! I'm off to the gym before work. Have a great week friends!